As a child I used to love decorating for the holidays. Once a year, we would put out turkey-themed items used only during Thanksgiving. Of course, as I became an adult (and a vegetarian, then a vegan) I recognized the irony of decorating for the holidays with cute depictions of the very animals served as dinner for the holiday that we were celebrating. 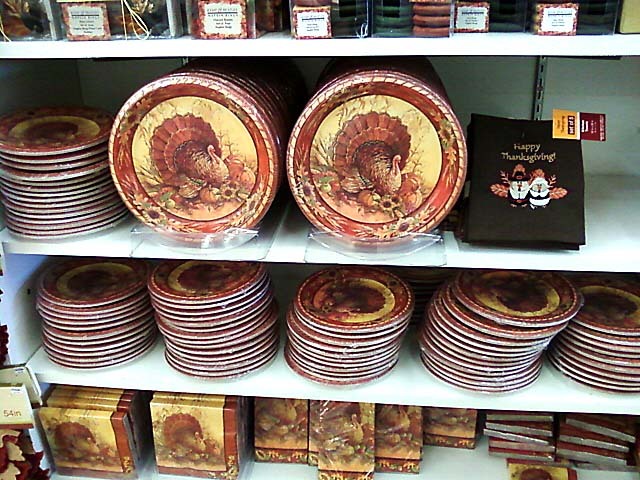 Rummage the holiday section of any retail/craft/stationery store and you’ll find a bounty of cards, stickers, jewelry, T-shirts, cookie cutters, dishes, napkins, salt & pepper shakers, centerpieces and more all displaying living and apparently happy turkeys. You can even get a cute turkey beany baby, stuffed animal, or a puppet. It’s art in motion. A slaughterhouse delivery truck is filled with plush animal toys, squeaking through the slatted boards of the truck. This display on wheels will be “touring the meatpacking district and then citywide for the next two weeks,” according to the Banksy website. What I love about Banksy’s “Sirens of the Lambs” is the seemingly subtle way in which it grabs attention to get a strong message across. It allows the viewer to make the connection without being turned off by the message. Let’s face it—there are some people who will forever be able to justify eating turkey and other animals regardless of any science-based evidence* or moral arguments presented to them. Banky’s piece (and 46millionturkeys) uses art and art making to reach those individuals who simply may not have made the connection between the fluffy stuffed animal or decorative center piece and the living, breathing, suffering animals we consume as food. *According to Worldwatch Institute (http://www.worldwatch.org/node/549): Yet, as environmental science has advanced, it has become apparent that the human appetite for animal flesh is a driving force behind virtually every major category of environmental damage now threatening the human future—deforestation, erosion, fresh water scarcity, air and water pollution, climate change, biodiversity loss, social injustice, the destabilization of communities, and the spread of disease.